On May 11-16 a series of wind, hail and rain storms struck most states east of the Rocky Mountains. Karen Clark & Co. a catastrophe modeling firm, estimates that the storms will cost insurers $2.5 billion. Most of the damage occurred in the Midwest, Northeast and Mid-Atlantic regions. Karen Clark predicts that insured losses higher than $100 million will be seen in: Colorado, Connecticut, Illinois, Indiana, Iowa, Kansas, Maryland, Michigan, New York, Ohio, Pennsylvania and Virginia. The weather system (referred to as a ‘ring of fire’) led to over 600,000 power outages in the Mid-Atlantic and Northeast states. 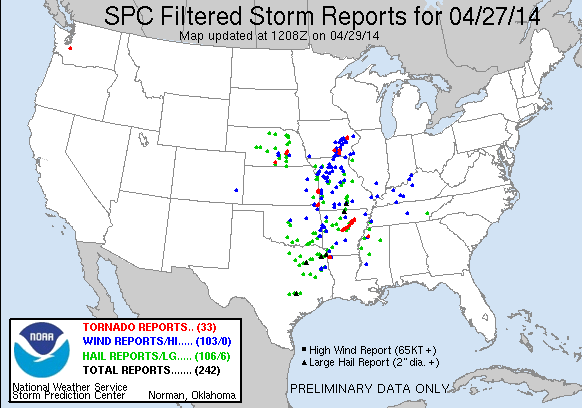 Wind gusts over 58 miles per hour were reported as well as hundreds of hail storms and 28 tornadoes. Although tornadoes can happen at any time during the year, on average, May is the expected peak of tornado activity. We’re reading about the economic and insurance impact of severe thunderstorms in the United States in April 2015, as reported by Aon Benfield’s latest Global Catastrophe Recap report. Five separate thunderstorm events in central and eastern parts of the U.S. caused expected insured losses of $2 billion, including more than $750 million from one event alone. What was the $750 million event? A widespread multi-day severe weather outbreak that hit central and eastern parts of the U.S. from April 7-10, leaving at least 3 dead and dozens injured. Major damage was noted across the Plains, Midwest and the Mississippi Valley following 25 confirmed tornado touchdowns, grapefruit-sized hail, damaging straight-line winds, and flooding rains, according to Aon. The April 9 EF4 tornado that devastated the communities of Fairdale and Rochelle, Illinois, is part of this event. Total economic losses were estimated at $1 billion, while insurers put losses beyond $750 million. Interestingly, Aon notes that much of the insured losses in this severe weather event were driven by claims resulting from hail. The Insurance Information Institute (I.I.I.) has some useful facts and statistics on hail here. It cites ISO figures that indicate events involving wind, hail or flood accounted for $16.1 billion in insured catastrophe losses in 2013 dollars from 1994 to 2013 (not including payouts from the National Flood Insurance Program). The I.I.I. also notes that there were 5,536 major hail storms in 2014, per statistics culled from NOAA’s Severe Storm database. Nebraska had the largest number of severe hail events in 2014, followed by Texas, Kansas, Iowa and Missouri. Over the 14 years from 2000 to 2013, U.S. insurers paid almost 9 million claims for hail losses, totaling more than $54 billion, according to a recent report by Verisk Insurance Solutions. That’s a hail of an impact. While certain parts of the country hold tornado drills and others test tornado preparedness systems, weather experts are pondering the slow start to tornado season. Capital Weather Gang cites a weather.com report that not a single tornado has been reported to the National Weather Service in March, typically the first month of severe weather season in the Plains and Southeast. The only other year since 1950 that there have been zero tornado reports in the first half of March was 1969, according to the Weather Channel’s severe weather expert Dr. Greg Forbes. Per Dr. Forbes’ report from January 1 to March 12, only 27 tornadoes had been documented across the nation — the slowest start to the year since the 21 tornadoes recorded through March 12, 2003. Sure enough a glance at the latest U.S. tornado statistics recorded by NOAA’s Storm Prediction Center shows 28 preliminary tornado reports so far in 2015 — 26 in January and 2 in February and 0 in March (to March 13). As insurers know, a slow start to any catastrophe season is not something to hang your hat on. In an average year, about 1,000 tornadoes are reported nationwide and tornadoes are among the largest causes of insured losses in any given year, accounting for 37.2 percent of insured catastrophe losses from 1994 to 2013, according to I.I.I. facts and statistics on tornadoes and thunderstorms. Meanwhile, Climate Central reports that an experimental forecast team has put together the first seasonal outlook for tornadoes in the U.S. That forecast suggests the highest chances are for an average tornado season. The researchers from Columbia University looked into how cyclical climate patterns known as El NiÃ±o and La NiÃ±a influence the larger atmospheric environment that sets the stage for tornado activity. In a new study published in the journal Nature Geoscience they show that while El NiÃ±o tends to dampen tornado activity, La NiÃ±a can give it a boost. Because the El NiÃ±o declared by forecasters earlier this month is a very weak one, the Columbia team is limited in what they can say about this year’s season, Climate Central says. But based on their findings, the team gives a 60 percent chance that the 2015 tornado season will see normal levels of activity, a 30 percent chance that it will be below normal and a 10 percent chance it will be above normal. A major severe weather outbreak continuesÃ‚ across parts of the southern and eastern U.S.Ã‚ today,Ã‚ as insurersÃ‚ rush to multiple states hit Sunday and Monday by a total of more than 90 tornadoes, some of which caused fatalities. A fact that often goes unreported is that tornadoes are among the largest causes of insured losses in any given year, accounting for 36 percent of all insured losses since 1983, according to the I.I.I. Increasingly dense suburban development across the U.S. is putting more people and property in areas at riskÃ‚ of tornadoes than ever before. Eighty percent of U.S. natural disaster related insurance claims payouts in 2013 were attributable to tornadoes and severe thunderstormsÃ¢â‚¬”$10.27 billion out of total estimate of $12.79 billion, according to remarks made in February 2014 by I.I.I. president Robert Hartwig, at the National Tornado SummitÃ‚ in Oklahoma City, Oklahoma. Hurricanes get the headlines, but tornadoes are stealing their thunder. The economic toll of tornadoes and severe thunderstorms is adding up – to the tune of an average $9.6 billion per year payout in insurance claims. I.I.I.’s CEO/President Dr. Robert Hartwig made that point clear at the National Tornado Summit held this week in Oklahoma City. Dr. Hartwig’s presentation on tornadoes and the insurance trends for severe convective events noted that tornadoes account for 36 percent of all insured losses since 1993; hurricanes losses over that time period were a just over 40 percent. He pointed out that areas in the heart of “Tornado Alley” may have 20-25 severe weather days each year. But, it’s not the number of storms that matters most. It’s all about where they hit. Tornadoes are part of the landscape in many areas of the U.S., and the landscape has changed. 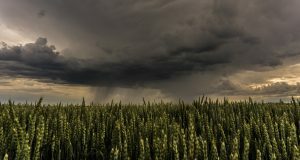 If a tornado touches down on farmland, there may be little to no structural damage, and no witnesses to record the event. Today, what was once farmland is dense suburban development, putting more people and more property in a twister’s path — and bringing more devastation. Average insured losses from thunderstorms are up seven fold since the 1980s. Historically, Oklahoma is second to Texas in terms of losses from tornadoes, thunderstorms and hail. The tornado that hit Moore, Oklahoma in May 2013 was the costliest storm of the year. At the Tornado Summit, Moore’s Mayor said he expects 85 percent of Moore residents will rebuild. That’s insurance at work! To help spearhead the rebuilding of schools in Moore, Dr. Hartwig presented the Moore Public Schools with a check for $10,000 following his presentation at the Summit. He reminded the audience that knowing the numbers associated with natural disasters is a small part of the story. It’s helping the people impacted that matters most to the insurance industry. The I.I.I.’s contribution on behalf of the insurance industry underscored the human factor of disaster recovery, and that reminder earned a standing ovation. Reports of a Ã¢â‚¬Å“small tornadoÃ¢â‚¬  in New Jersey hit very close to home Monday morning as I was driving to an appointment when torrential rain and thunderstorms bore down. 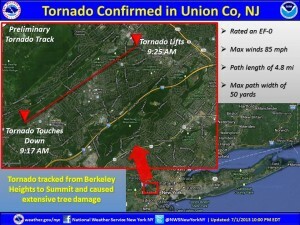 The National Weather Service (NWS) has confirmed that the EF-0 tornado touched down in Union County, New Jersey, amid a band of thunderstorms that brought heavy rain and flooding to parts of the state yesterday. The tornado touched down in Berkeley Heights and for eight minutes cut a path nearly 50 yards wide and 4.8 miles long northeast through New Providence and Summit. Winds reached an estimated 85 mph and extensive tree damage was observed along the tornado path, the NWS said. The NJ Star Ledger reports that New Jersey has experienced at least one tornado in each of the last five years, according to records from the National Oceanic and Atmospheric Administration. All of them were listed as EF-0, the lowest designation. An EF-1 tornado is also confirmed to have touched down in Connecticut yesterday, causing property damage. Check out I.I.I. facts and statistics on tornadoes and thunderstorms. ItÃ¢â‚¬â„¢s a little ironic that in the weeks preceding the devastating May 20, 2013 Moore, Oklahoma tornado, there were numerous reports of how 2013 tornado activity was at a record low. Unfortunately, these headlines may give the mistaken impression that the United States is in a period of lower risk for tornadoes, and/or that the costs from such events are declining. Yet as weÃ‚ have seen repeatedly during hurricane, tornadoÃ‚ and wildfire seasons, itÃ‚ only takes one storm, or event, to remind us of the dangers and ongoing risks. Dr. Robert Hartwig, president and chief economist of the I.I.I., notes that the U.S. is actually in the midst of the most expensive period in recorded history for thunderstorm events, which include damage from tornadoes. — The $7 billion in insured damages (in 2012 dollars) that resulted from the May 2011 tornado outbreak, which also impacted numerous states. Joplin, Missouri, was the hardest hit community, incurring $2.2 billion of the $7 billion in damages, making that tornado the single largest insurance event in MissouriÃ¢â‚¬â„¢s history. A post on the Wall Street Journal Money Beat blog suggests that property/casualty insurers will face at least a few billion dollars of insured losses from the May 20, 2013 Moore, Oklahoma tornado, according to rough calculations by Wall Street analysts. Check out the New York Times for panoramic images taken Tuesday comparing the same locations before and after the storm struck Moore. Data on tornadoes can be both unreliable and inconsistent, making it impossible to identify long term trends, according to a new report from LloydÃ¢â‚¬â„¢s. Tornado records underreport tornado numbers and changes in classification of tornado strengths adds further uncertainty, making it even more difficult to determine trends in tornado frequency and severity, the report says. Even in the United States detailed records only exist back to 1950. While the number of officially recorded tornadoes has risen, this can be attributed to better reporting, tracking and more people, homes and infrastructure in the path of a tornado, LloydÃ¢â‚¬â„¢s says. Note: 2011 was an unusually active and deadly year for tornadoes across the U.S., with over 1,600 tornadoes recorded, more than any other year on record except for 2004. Costs were high, with seven individual tornado and severe weather outbreaks recording damages that exceeded $1 billion. Total damage from the outbreaks is estimated at in excess of $28 billion. But while the number of violent tornado losses may not be increasing, insured losses are. Check out I.I.I. facts+statistics on tornadoes here. PC360 has more on this story. Extreme weather event losses in the United States dominated natural catastrophe loss statistics in the first half of 2012, according to a review by Munich Re and the Insurance Information Institute (I.I.I.). InÃ‚ the 2012 half-year natural catastrophe review, Munich Re noted that some 85 percent of worldwide insured losses and 61 percent of overall losses were incurred in America, predominantly in the U.S. Ã¢â‚¬“ compared with an annual average of 65 percent and 40 percent respectively since 1980. Severe thunderstorm, tornado events in the U.S. accounted for the five costliest natural catastrophes for the insurance industry in the first six months of the year. 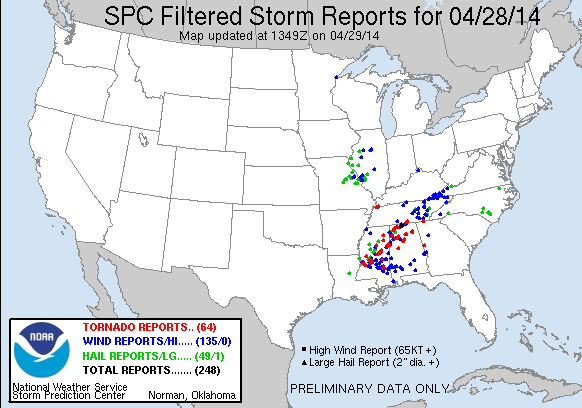 The most severe single event was a squall line that crossed several states between 2 and 4 March. Some 170 tornadoes were counted in and around the Ohio and Tennessee River alone, and a small number of communities were almost completely destroyed. Insured losses totaled $2.3 billion. The good news for insurers is that natural catastrophe losses in the first half of 2012 were relatively moderate. Overall global losses to the end of June were $26 billion, of which some $12 billion were insured. In a recent post over at the Property/Casualty Insurance blog, Gary Kerney commented that for decades, hurricanes got the headlines and caused more insured losses than tornadoes and thunderstorms, but last year, all that changed. More facts and statistics on tornadoes and thunderstorms from the I.I.I. As well as strong winds and heavy rains, hail Ã¢â‚¬“ ranging from pea to baseball size Ã¢â‚¬“ was a feature of the massive tornadoes that touched down in the Dallas Fort Worth area yesterday. Specifically, the Dallas-Fort Worth international airport reported that more than 100 aircraft were damaged by hail, according to CNN. 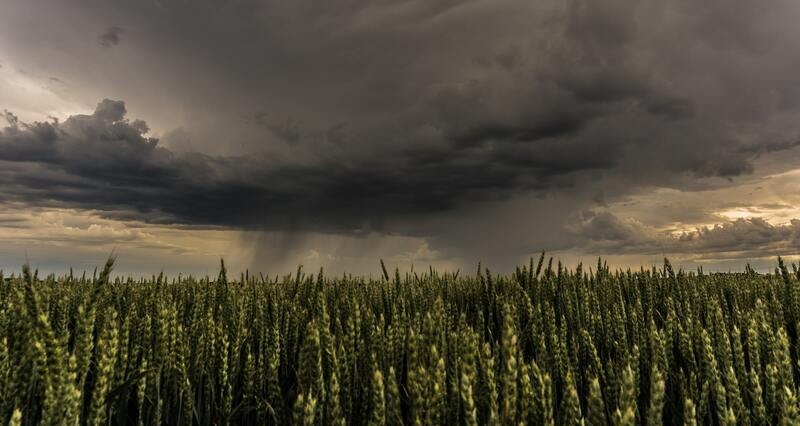 Hail causes about $1 billion in damage to crops and property each year, according to the National Oceanic Atmospheric Administration (NOAA). Pea size hail measures an estimated Ã‚ ¼ inch in diameter, while baseball size hail would measure about 2 Ã‚ ¾ inches. The Insurance Information Institute (I.I.I.) reminds us that hail damage is covered under standard homeowners insurance. It is also covered under your auto policy provided you have comprehensive coverage. Some insurers may have special deductibles in hail prone areas, to help keep insurance premiums at affordable levels. Physical damage to aircraft as a result of hail would be covered under a hull insurance policy. The I.I.I. reports there were over 9,000 major hail storms in 2010, according to statistics from NOAAÃ¢â‚¬â„¢s Severe Storms database. Texas had the largest number of severe hail events in 2010, followed by Kansas, Missouri, Nebraska and Oklahoma.